Fields, J.R. and Fields. (2009). Verne, Jules (1828-1905). In H.J. Birx (Ed. ), Encyclopedia of time: science, philosophy, theology, & culture. [Online]. Thousand Oaks: Sage Publications. Available from: https://search.credoreference.com/content/topic/jules_verne_1828_1905 [Accessed 25 April 2019]. Fields, Jennifer R., and Fields. "Verne, Jules (1828-1905)." Encyclopedia of Time: Science, Philosophy, Theology, & Culture, edited by H. James Birx, Sage Publications, 1st edition, 2009. Credo Reference, https://search.credoreference.com/content/topic/jules_verne_1828_1905. Accessed 25 Apr. 2019. (vûrn; zhül vĕrn), 1828–1905, French novelist, originator of modern science fiction. After completing his studies at the Nantes lycée, he went to Paris to study law. He early became interested in the theater and wrote (1848–50) librettos for operettas. For some years his concerns alternated between business and the theater, but after 1863 he drew upon his interest in science and geography to write a series of romances of extraordinary journeys, in which he anticipated, with remarkable foresight, many scientific and technological achievements of the 20th cent. See Evans, A. B. , Jules Verne Rediscovered (1988);. Lottman, H. , Jules Verne: An Exploratory Biography (1996). Jules Gabriel Verne was born on February 8, 1828, in lie Feydeau, in the city of Nantes, France. He was the first of five children born from the marriage between his father Pierre, a Parisian attorney who came from a lineage of jurists from Provence, and Sophie Allotte de la Fuye, of Breton and Scottish origin. Verne began the study of law in Paris but chose instead to pursue his passion for literature and the theater. When Pierre Verne realized his son's ambitions no longer included jurisprudence, he withdrew all financial support. Verne never practiced law, but his writings, which explored the themes of time and the future, would earn him a secure place in world literature. During the 1850s Verne attempted to survive financially as a playwright and published several works, including Blindman's Bluff. In 1856, Honorine Deviane, a widow with two children, was introduced to Verne at a friend's wedding. Eight months later, on January 10, 1857, the two were married. At some point after their introduction Jules became a stockbroker and it is speculated he made this career change in order to provide for his family. Four years later, on the August 3, 1861, the couple's first and only child, Michel, was born. “De laTerre a la Lune”(“From the Earth to the Moon,” 1865). Here the space travelers board the moon-projectile in Jules Verne's account of space travel. Source: Mary Evans Picture Library/The Image Works. 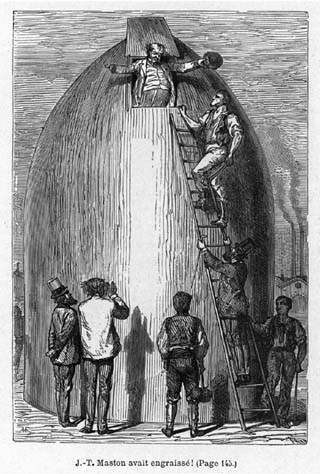 In January 1863, when Verne was 30, his first novel, Five Weeks in a Balloon, was published. The text described a futuristic hot-air balloon adventure set in Africa, an area relatively unknown to Europeans. Although his work had both geographical and scientific flaws, Verne's book was ahead of its time. Five Weeks in a Balloon proved to be the first in a series of novels that described technology that did not yet exist or was in only the earliest stages of development. From 1862 to 1886, Verne lived in Amiens with his family but traveled to the United States to visit New York City and Niagara Falls. During this period he also visited many European countries and gained both worldwide fame and a modest fortune. On March 9, 1886, Verne's mentally unstable nephew, Gaston, shot him with a pistol. A bullet entered Verne's left shin, giving him an incurable limp. Gaston was judged to be mentally ill and spent the rest of his life in an asylum. The time of the shooting coincided with the deaths of Jules Verne's mother and his longtime friend and publisher Pierre-Jules Hetzel. Following Verne's death on March 24, 1905, his son Michel began to publish his works after substantial revision; the revised works began to appear in 1919. Four of Jules Verne's best-known novels include Journey to the Center of the Earth (1864), From the Earth to the Moon (1865), Twenty Thousand Leagues Under the Sea (1870), and Around the World in Eighty Days (1873). From oceanogra-phers in submarines to space walks on the moon, the author sparked the imaginations of millions. Prophetically, descriptions of such later developments as television, automobiles, skyscrapers, high-speed trains, and many other modern technologies resonate throughout his novels. It is not an exaggeration to state that Verne's ideas produced a greater interest in technological advancement and influenced modern-day society. As one of the pioneers of the science fiction genre, along with others such as H. G. Wells, Jules Verne led the way for others to dream and create. In the 20th century Verne's novels were translated into 140 different languages and were the basis for a number of popular movies. Clarke, Arthur C, Futurology, Novels, Time in, Wells, H. G.
Lottman, H. R. ( (1997).). Jules Verne: An exploratory biography. New York: St. Martin's. Martin, A. ( (1990).). The mask of the prophet: The extraordinary fictions of Jules Verne. Oxford, UK: Oxford University Press. Source: Courtesy, Library of Congress.